In a large resealable bag, combine flour and cayenne pepper. 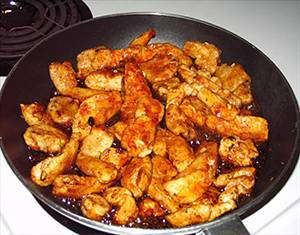 Cut chicken into strips and add chicken a few strips at a time to bag. shake to coat. In a skillet with butter, brown chicken on all sides. Combine the lime juice, honey, brown sugar and Worcestershire sauce; pour over chicken. Cook for 1-2 minutes or until juices run clear and sauce is thickened. Note: vary the amount of Worcestershire sauce and lime to your own taste. 2296 members have added this recipe to their cookbook. food groups ordered by calorie contribution to recipe. Pretty good! Needs just a little more Worchester sauce for flavor but it was nice that the lime was not over powering! This recipe was AWESOME!! I served it with steamed broccoli tonight. Next time I will also serve it with brown rice to take advantage of the yummy honey lime sauce. It was a hit with my hubby and my son. Made this with fresh squeezed limes insred of juice and then added the lime zest at the end. Awesome! I loved the simplicity of this....I did some different things to it...I didn't use honey, but Lyle's Golden Syrup (a British import), I used True Lime crystals rather than juice... and I didn't flour the chicken before sauteing in butter...and added a tiny bit of Wondra flour after all ingredients were in the skillet to thicken....then I made rice to put the chicken over....the rice didn't help the calorie intake, but made a full meal!!! And it was DELISH!!!! This is a regular in our house. We add some Buk Choy to ours. Just made this tonight. It was FANTASTIC. Definitely recommend it. I just switched out the honey for light Agave nectar. Really quick meal - had mine with broccoli and spiced basmati rice. Cut the chicken into strips and pop on the broccoli to boil as well as setting the rice to cook. Quickly coat the chicken and cook whilst making the sauce. 10 minutes later - ready to eat. A 15 minute meal that is tasty, great flavours and a winner with all of the family. Cut the rice and have with salad in summer, or add some habanero and winter vegetables to eat as a winter warmer. The taste is fantastic! Great recipe! There are 376 calories in 1 serving of Honey Lime Chicken. Calorie break-down: 19% fat, 44% carbs, 38% protein. 24 other members have added this recipe to their cookbook for The South Beach Diet, Phase 2.